Quest for Flight and Flying Machines present the history of aviation through 1910. This poster takes that history to the next step. 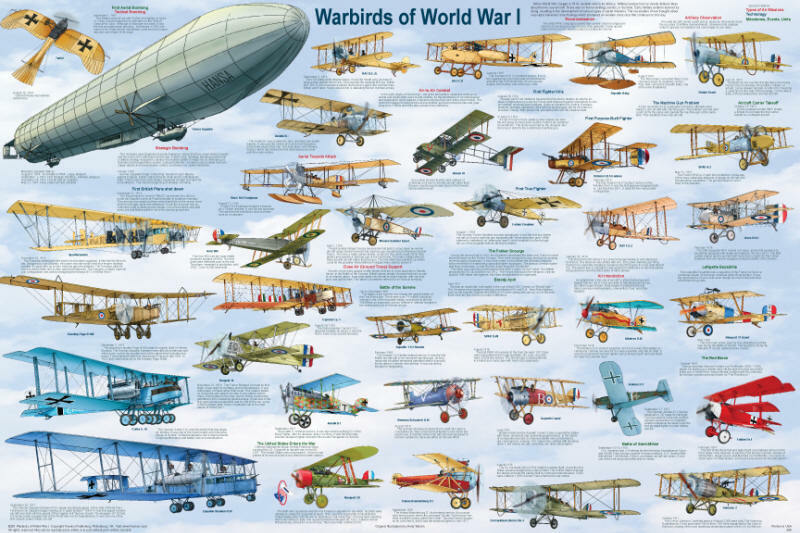 It shows the most famous aircraft of the “war to end all wars,” but does so in a unique way. When the war began, aviation was in its infancy, and constant combat experience resulted in rapid innovation and invention. It was the beginning of the aviation arms race. The pictured aircraft all played a role in this great drama, as explained in their captions. All of the widely flown aircraft are shown. In addition, there is information on technological advancements, important events, and the development of various combat missions. This poster is filled with great original illustrations and fascinating facts.